This is a photogrammetric image (©EEF/Black Sea MAP) of The Flower of the Black Sea, an Ottoman ship that has been given her name because of the floral patterns found carved on her tiller. Nobody yet knows what she was carrying or where she was going when she sank off the Bulgarian coast some time between the 17th and 19th centuries. 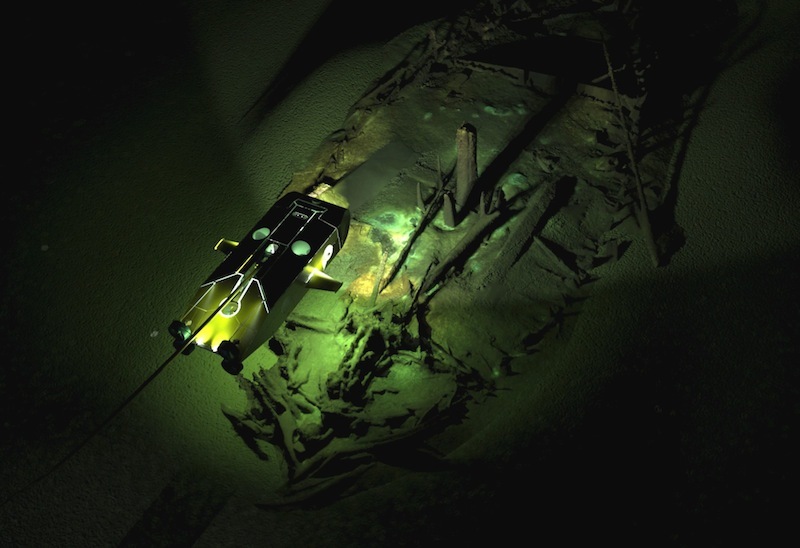 She is just one of more than 40 ships dating back to 9th-century Byzantium that were identified nearly a mile beneath the Black Sea in September by a team from the University of Southampton's Centre for Maritime Archaeology, for the Expedition and Education Foundation (EEF), a charitable organisation for marine research. Too deep for traditional divers, the sea’s wrecks have been protected by oxygen-free water. 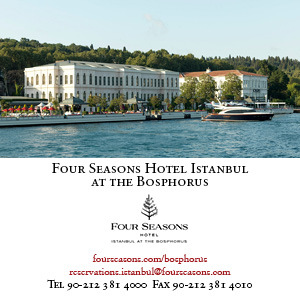 While such rivers of the Danube, Dneiper and Don make the upper layer of fresh-water of around 150 metres, salt water arriving through the Bosphorus makes up the lifeless depths beneath and ensures there is nothing alive to eat away at lost ships and their cargoes. 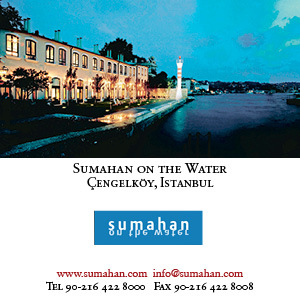 After the Mediterranean broke through the Bosphorus at the end of the Ice Age, the water level in the Black Sea began rising. It was research into how this historic landscape developed that was the purpose of the University of Southampton’s Black Sea MAP (Marine Archaeology Project), conducted with, among other institutions, the Bulgarian National Institute of Archaeology and the Bulgarian Centre for Underwater Archaeology (CUA). The project involved the hire of a state-of-the-art Multi Purpose Support Vessel (MPSV), Stril Explorer, built in Norway, with a helicopter pad and remotely operated undersea vehicles (ROVs) that can be lowered to the sea bed where core samples can be taken. The project also had state-of the art computers that employ photogrammetry, a process whereby the thousands of photographs taken by the remote cameras could be turned into three-dimensional images. The findings brought new understanding about the development of Mediterranean cargo ships, dating the quarter deck and the use of a single rudder earlier than previously thought. Before the arrival of the Ottomans, the Italian empires of Genoa and Venice were the great maritime traders around the Black Sea. Their ships sailed through the Bosphorus beneath the gaze of the Galata Tower in Istanbul and the Genoese castle above Anadolukavağı. Varna, in Bulgaria, was the first port beyond Istanbul for vessels heading north to Crimea and the port of Kaffa (today’s Feodosiya, described in Cornucopia 49, a special edition on the Black Sea). Granted to the Genoese by the Golden Horde in 1271, it gave the Italians a virtual monopoly of Black Sea trade for some two centuries, and from the Silt Explorer’s images, a typical two-masted lateen-rigged vessel of the time has been drawn. Cargoes included silk and spices from the east, furs, timber, ceramics as well as such staples as corn, fish and wine. There was also an important trade in slaves. According to Neal Ascherson’s book Black Sea, Venetian merchants purchased them for the Italian market, while most of the 1,200 male slaves that the Genoese shipped abroad annually went to the Mameluke sultans of Egypt. 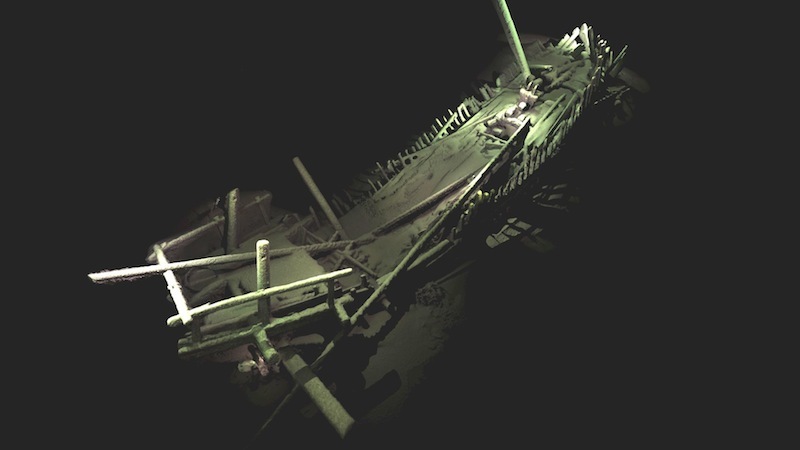 Pioneering work in Black Sea archaeology was undertaken in 2000 by Titanic archaeologist Robert Ballard at Sinop, who set out to prove vessels might be intact in the anoxic depths where a vessel from 410-520 AD was discovered. It will take a great deal more money and effort to examine these new finds and their cargoes, to discover exactly what they were carrying and where they came from. Perhaps the success of Black Sea MAP, however, will inspire further exploration of the coast of Turkey and other countries around the Black Sea.